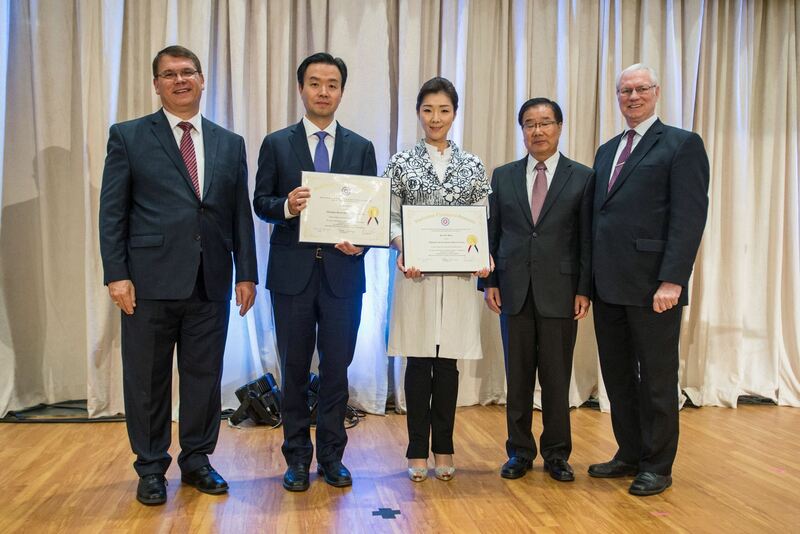 FFWPU USA: Two honorary doctorates were awarded on Saturday, May 30 by the Unification Theological Seminary to Ms. Sun Jin Moon and Mr. In Sup Park during a luncheon held in the banquet hall at the International Peace Education Center in Las Vegas, Nevada. “In Sup Park, you have lived a life dedicated to establishing strong business ethics while also serving the greater good. “You demonstrated your commitment to living a life of service early in your career as a volunteer for the Universal Peace Federation and the Tongil Foundation; later becoming a Board Director for the Tongil Foundation. Through your continuing service in these organizations, you have worked on international and intercultural projects that have reached out to those in need. You then took this foundation of service with you when you became the Director of the High School of the Pacific, modeling for the global students how to serve the greater good while also maintaining excellence in one’s professional life. You expanded your commitment to service on a global level when you became the International Vice President of the Family Federation for World Peace and Unification International, emphasizing the value and role of the family in today’s society. “As a businessman dedicated to bringing a clear set of ethics and principles to the international business arena, you have contributed to the world of media and the hospitality industry as a Board Director for the New Yorker Hotel, Chairman of the Pacific Rim Integrated Development Group and a Board Director for the Segye Times. In each role, you have sought to introduce and convey strong management principles and the value of professional integrity while also encouraging an ethic of service, demonstrating that it is possible to be successful in business while maintaining an ethic of service and moral character. The festive luncheon included celebratory songs by Mrs. Seiko Lee and Matthew Hill. Kwon Jin Moon also sang, as did True Mother herself.